Villa Amelia w/Mt.Views from Private Pool & Spa! There's nothing more enjoyable than the privacy of a vacation home, when comparing amenities to that of a hotel room or condo multiplex. 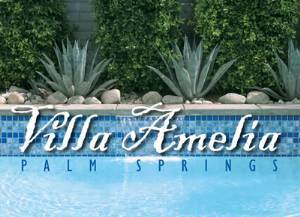 VILLA AMELIA is located in a newly built subdivision just north of the bustle of downtown Palm Springs, yet far enough away for quiet seclusion and total privacy. 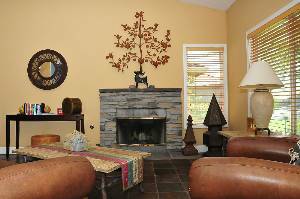 Elegant home décor includes leather furniture, slate tiled floors, a rustic stone fire place, and 1 king & 2 queen beds. All rooms are upgraded with new stylish comforter bedding, sheets are 600 thread-count with down pillows, and down mattress pads for your sleeping comfort. As always, reservations include exceptional cleaning, bath linens, and oversized beach towels for parties of up to 6. From the master, there are French doors leading to a private backyard with a sparkling 15 x 30ft. pool & spa and mountain views to the west. The patio deck also includes outdoor dining for 6, and a stainless-steel BBQ Grill. We offer 3 cable TVs/DVD, stereo and sofa-sleeper in the family area. NEW! We just added a 32" flat screen TV w/DVD combo and AppleTV interactivity. Our semi-formal dining area will comfortably seat 6; and the bright modern kitchen contains all the culinary amenities for those home cooked meals. Large enough to accommodate 6 adults, this home is available for getaway weekends, long vacations, and special holidays. High Speed Wi-Fi Internet Access and we just added a 32" Flat Screen TV with DVD combo and AppleTV interactivity. Access your iTunes account to download your favorite movies, or play and display YouTube and other apps from your iPhone/iPad onto the large screen. Every Thursday evening from 7-10pm along North Palm Canyon Drive from Baristo Rd. to Amado Rd. The street is closed-off for pedestrians and a variety of vendors displaying quality arts & crafts, food, live entertainment, and Certified Farmers Market Produce. A deluxe, family-oriented water playground with 18 major water slides and attractions including the 800,000-gallon Rip Tide Reef wave pool. Kids yes, but adults will also have a blast too! A “Must see” when in town, you'll be taken on the world's largest rotating tramcar to the top of Mount San Jacinto - 8,516 feet above the desert valley and 20 degrees cooler. There you are transported to the threshold of the 13,000 acre Mt. San Jacinto Wilderness State Park, with 54 miles of biking trails, cross country hikes, and magnificent views of Coachella Valley below. Also at the top is an alpine restaurant, cocktail lounge, and a 22 minute film documenting the history of the tramway. Take Palm Canyon Drive to Tramway Road. Indoor and air-conditioned hanger, this expansive collection of featured propeller-driven World War II aircraft are all in flying condition. Enjoy the 60-seat Buddy Rogers Theatre of the Air, a restoration center, plus photographs and memorabilia. Finish your fun-filled day dining on delicious cuisine. If you like gourmet Chinese food with a flair for the unexpected, then you’ll love this restaurant. I eat here often when in town. Beautifully designed interior with coi pond and Pagoda Bridge, the atmosphere is warm and inviting. I recommend booking your party in the private VIP room. 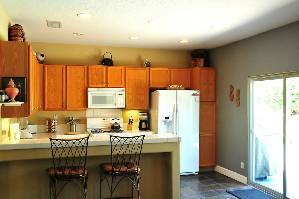 Small 1 bdrm condo on Tahquist Creek Golf Course. When I arrived to meet my extended family from Southern California, Jon (the owner) had already installed an ew flat screen TV with Apple TV "on demand" capabilities into the living room. There was also a brand new range/oven installed and the pool and spa had been recently cleaned. New rafts were also in the master bedroom closet, as well as nice curtains on the master windows. I have stayed here before but it seems to get better each time. It starts getting quite hot in the desert this time of year, but I find the Villa Amelia pool is optimal for lounging at this time of year because the air is warm and the pool does not need to be heated. My young nieces thoroughly enjoyed the pool all weekend. The youngest slept comfortably in the Pack-n-Play. We also loved running around the corner to the grocery store for extra snacks and drinks and even pretty decent take-out pizza. We spent 4 days here, very clean house, great big pool - with 4 adults and 4 kids, it was just right. The grocery store is sooo close, so is McD :) and downtown with all the shopping. Thank you!! we had a great time. Love the tanning shelf in the pool, it was very convenient. This rental provides everything you could ask for in a Palm Springs get away! 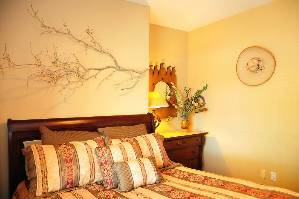 The home is meticulously maintained and expertly decorated, providing a welcoming atmosphere that you don't always find in rental homes, for a very affordable rate. The house is only a short drive from downtown Palm Springs, but you're going to find it hard to leave with your own personal oasis in the back yard. The owner was very friendly and easy to work with. I highly recommend this rental! After a long, cold, wet Seattle winter & spring, staying at Villa Amelia for a weekend in May this year was truly delightful! The backyard pool is a masterpiece: nicely tiled, lots of room to float around, with a jacuzzi tub that runs into the main pool via waterfall. There's also a shallow sunning area to stay warm+cool at the same time. Loved floating around the pool, taking a break from some much needed vitamin D therapy (ie. sitting in the sun). The rooms were big and well-appointed; we slept soundly in the sleigh bed. We had a big group with several pregnant ladies, and plenty of room to move around the house. Bathrooms were spotless, and we never ran out of hot water or towels (washer+dryer on site). Its in a cute, quiet neighborhood, walking distance from Albertson's grocery store which had everything we needed. All in all a great place to stay for a relaxing weekend in Palm Springs. We'll definitely be back! This house was such a great getaway!! I went for a girls weekend in June and it was great! The house was clean, filled with great amenities in the kitchen, and the Ipod speakers went to great use out by the pool. We spend most of our time outside in the gorgeous backyard, poolside on the sunbathing deck! 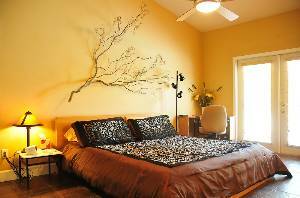 The beds were super comfortable, and it accommodated six people very comfortably. This house was around the corner from our local grocery story, and only a cab ride away from downtown eating and shopping. I would highly recommend this house for a fun weekend getaway! My husband brought me here to celebrate our 6th Anniversary. It was a surprise, and the moment we stepped in - we were thrilled. As all previous guests have said, the Pool was the best part. It really was! This was the perfect get-a-way from our busy lifestyles. This was also my first time to Palm Springs. – We visited the tram which really is a “must see!” And don’t miss downtown and stopping for some Ben&Jerry’s ice-cream. Thanks for making our anniversary so relaxing and wonderful! Next time, we plan to come here with family & friends. We were visiting from Orange County, not too far away. We were searching through the net when we found this place, Villa Amelia. The weather here is very hot, about 110 degrees every day which made the pool a desired place to be in. We got to hike some trails when we went up the tramway to the top of the mountain. Beautiful! - It was also about 30 degrees cooler up there than on the desert floor. Thursday evening, we went to the VillageFest. It was fun to walk Palm Canyon Drive (closed to traffic), view the city at night, and see all the interesting craft goodies. Our stay was very comfortable and relaxing. It was more than any hotel could offer for our big family. We absolutely enjoyed our stay at your Villa Amelia! It was so nice to be able to cool down in the pool and relax in the spa in the private backyard. This charming vacation home, Villa Amelia in Palm Springs has provided a fabulous setting for numerous repeat visits now! I have enjoyed friends and family for quick weekend getaways and holiday celebrations. The fireplace is especially enjoyable while sipping wine, lounging on the leather couch, after a refreshing dip in the pool and hot spa. I especially enjoy sitting in the hot spa with the view of the snow capped mountains in the near dastance. Oh, and the new bed linens and towels rival those at any 5 star resort! You can count on more repeat visits from me! This is a great place to stay – we loved the pool and Jacuzzi with the mountain views. The house was wonderfully decorated. We really appreciated the duvet in the master bedroom, very fluffy! - Many thanks for the wine & cheese on our arrival; it was a very nice touch. All in all, it was great to be here and it was a real break from a big city like London (where we live). We’ll be back! What a perfect desert oasis! Your home and all its fabulous amenities made for a terrific Spring break from dreary Chicago. We enjoyed the tram, Joshua Tree, Village Fest and especially the restaurant, Azul. The sun, Cacti, pool and spa, seclusion and daily visits by a hummingbird all contributed to a wonderful vacation. Exactly as advertised on the internet. We left Saskatoon, Saskatchewan, Canada in -24 degree weather. Landing here the temperature was 70 degrees, quite a welcome change? We have really enjoyed exploring Palm Springs, culturally as well as historically. The pool and spa were our relaxing moments and when the temperature here dipped to 60 degrees the hot tub was fantastic. I enjoy being out doors and really liked jogging and walking in a safe neighborhood. We found it to be a surprise that the sun went behind the mountains so early in the afternoon (we are from the prairies where we are used to seeing the horizon). As I jogged through the neighborhood I found the different plants used in landscaping to be so interesting to me. Thanks for everything. We were quite late in booking for a winter break and were excited to find your home available on the net. It takes a bit of courage and trust to send off our rent to a stranger. We are very pleased with your home and appreciate the supplies that are here. We’ve hiked up the museum trail and the Indian Canyons, seen our first every oasis and enjoyed it all. The big hit each afternoon is the pool and hot tub. A blizzard is in effect at home so this is a great respite. I was researching online for a resort/casita with private pool for my husband’s birthday when I came across the website for Villa Amelia. I was a bit skeptical at first because it all looked and sounded so wonderful. I was also concerned about the close proximity to other neighbors and whether we’d feel as though we were secluded. All those concerns vanished the moment we stepped onto your property. It was the most relaxing time we have had in quite a long while. Our friends laughed at us when I told them when we were coming to Palm Springs (August can be hot) but we were blessed with milder weather and it was fabulous. The beautiful pool kept us nice and cool and we never once had any issues with the heat. That’s really all we did we just spent our time lounging, relaxing and enjoying. My husband was thrilled with Villa Amelia and is already looking forward to our next visit. Thank you so much for sharing your home with us. In addition to rate, there is an 11.5% Tax, a $175 Cleaning Fee and Utilty Charge for heating private pool and spa. Deposit: There is a minimum $500 damage deposit that is refundable one week after departure if reservation is paid with credit card. Cancellations and Refunds: CANCELLATIONS: If it is necessary to cancel reservations, please notify us as soon as possible. If a cancellation is made prior to sixty (60) calendar days from the arrival date, a full refund minus 10% of amount paid will be returned to Guest. For cancellations with less than sixty (60) days notice, no refund of the funds paid will be given. No refunds will be made for unused days or early departures. However, we will try to re-rent the house. If the house is re-rented at the same rate for the entire period of your original reservation, at no loss to the owner, then Guest will receive the balance of the advance Payment less an amount equal to 10% of the total. All refunds will be made within 30 days of receipt of the re-rented advance Confirmation Payment. If the house is not re-rented, no refund shall be paid. If possible, a good faith effort may also be made either to arrange an alternative accommodation for the same period, or another acceptable date. If, for any reason, the Owner cancels a confirmed reservation or the Property is rendered uninhabitable, other than as a result of a default by the Guest or an invitee of the Guest, the Owner will refund the Guest’s deposit and balance. Other Fees: There is a min. $500 security deposit, a $35/day or $200/week utility fee for heating & operation of private pool & spa. Gas/Electricity paid directly by guests on reservation of 14 days or longer.